Crabs are much more versatile than most people realize. They can be steamed or boiled of course, or made into crab cakes. However, they’re also great in soups, chowders, stews, casseroles, and other wonderful dishes. Soft-shell crabs can be battered and fried whole, and crabs and crab legs are amazing on the grill, too. Crabs are high in protein and are also a good source of niacin, vitamin B12, chromium, selenium, iron, zinc, calcium, potassium, phosphorus, and magnesium. 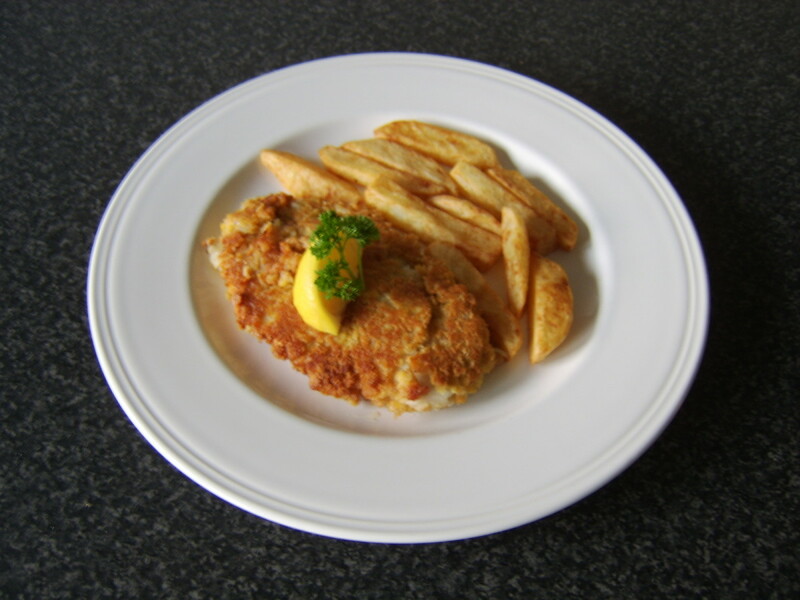 Crabmeat is very low in saturated fat, but it’s high in cholesterol. With all the crab varieties on the market, sometimes it’s hard to know exactly what to buy. Which variety is best? Should you buy live crabs, crab legs, crab claws, or crab meat? Below is some information that might help! 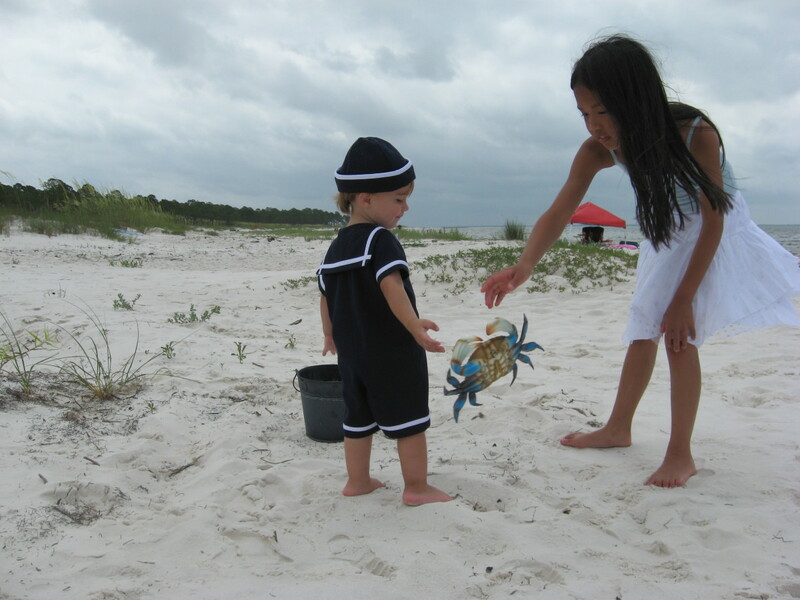 My grandson, Tristan, and niece, Madison, on a crabbing expedition. I've told them about playing with their food! 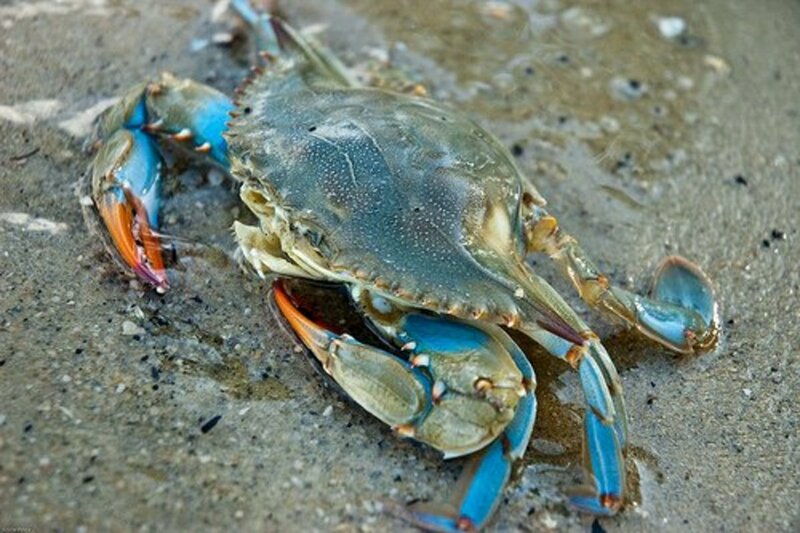 Blue crabs are in the Atlantic Ocean, from Maine to Florida, and in the Gulf of Mexico. They’re caught with dredges, traps, and bottom trawls, and also as a by-catch on shrimp boats. These crabs are incredibly sweet—and many aficionados prefer them to any other type of crab. They’re sold live, cooked whole, frozen, and as picked meat. Blue crab claws are also available. 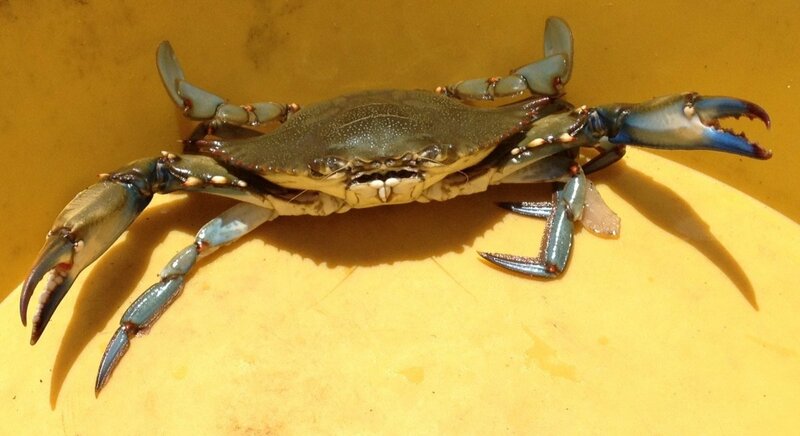 Soft-shell crabs are blue crabs that have molted. 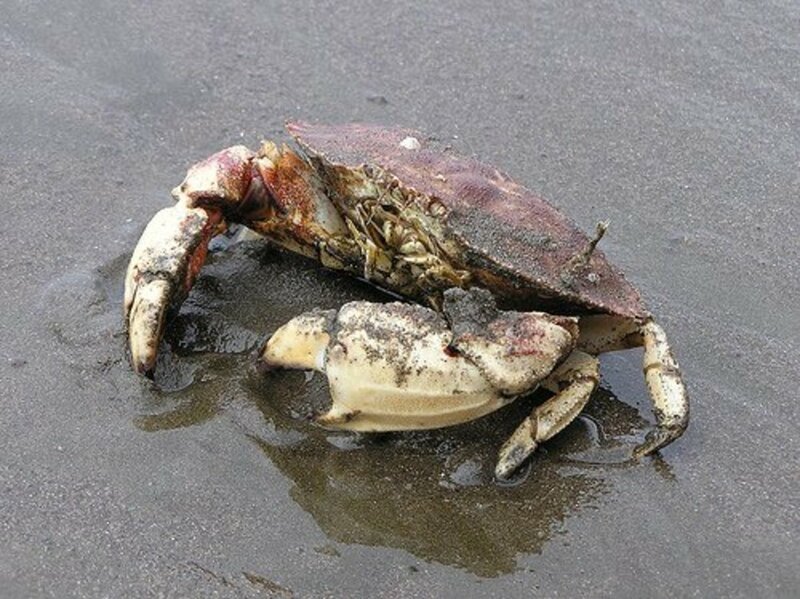 In order to grow larger, crabs have to shed their old shell and form a new one. During this process, the crabs are without their hard covering for only a few days, and they’re only truly soft-shells for a few hours. Soft-shell crabs are a delicacy and are eaten whole after minimal cleaning. 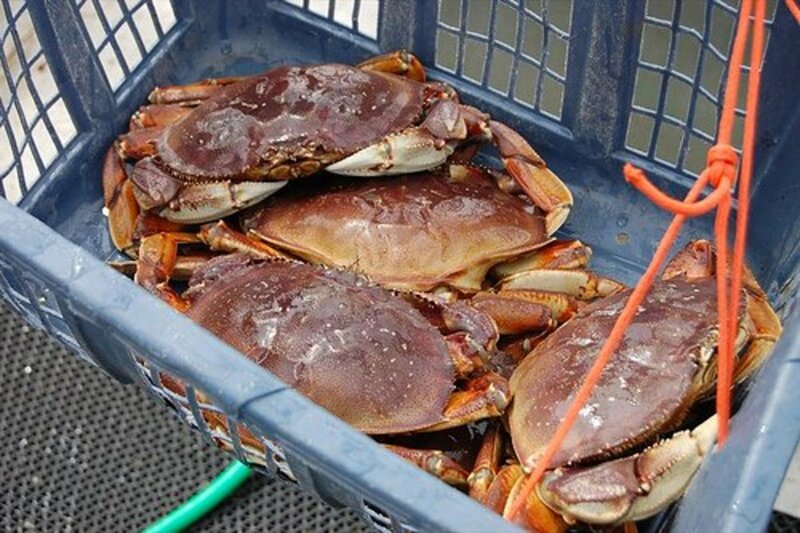 These delicious crabs are found in the Pacific, from Alaska to central California. They’re caught in nets, traps, pots, and on hook and line. Only adult males are kept. 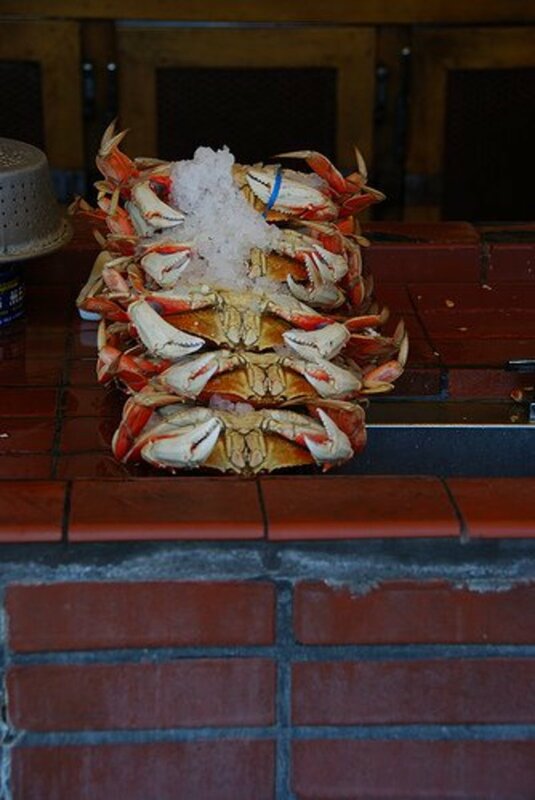 Dungeness crabs are very meaty. They’re sold live, as whole cooked crabs, and as picked meat. The Jonah crab is the Atlantic’s answer to the Dungeness. They’re found off the coast of North Carolina, up to Maine, and are caught with traps, pots, hook and line, and bottom trawls. The meat is sweet and flaky, and the claws are very meaty. They’re sold in clusters, as legs only, and as claws. King crabs are caught in Alaskan waters with trawls, traps, and nets. The average crab harvested weighs about six pounds, but they can grow much larger. 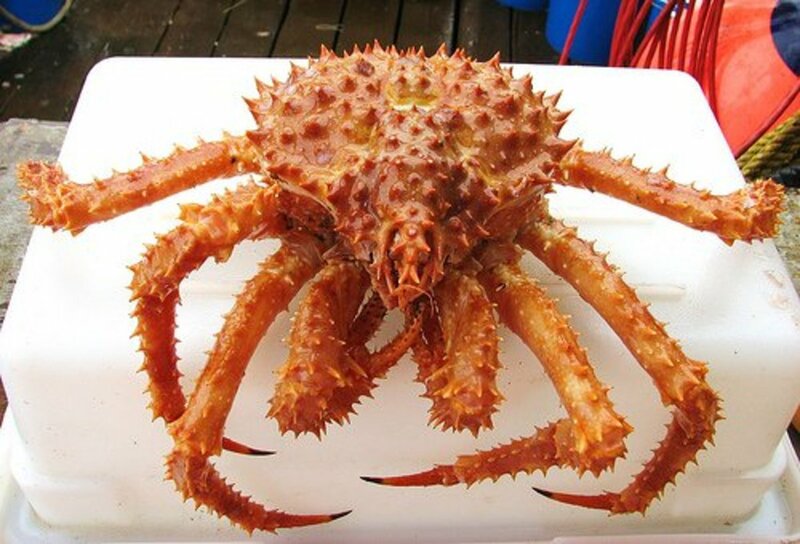 King crab is sold in legs and claws. The flesh is delicate and deteriorates quickly. If you purchase it frozen, keep it frozen until ready to cook. Snow crabs are found in the coastal waters of Alaska and Maine, and are harvested with the use of traps and pots. They have a sweet and delicate flavor. 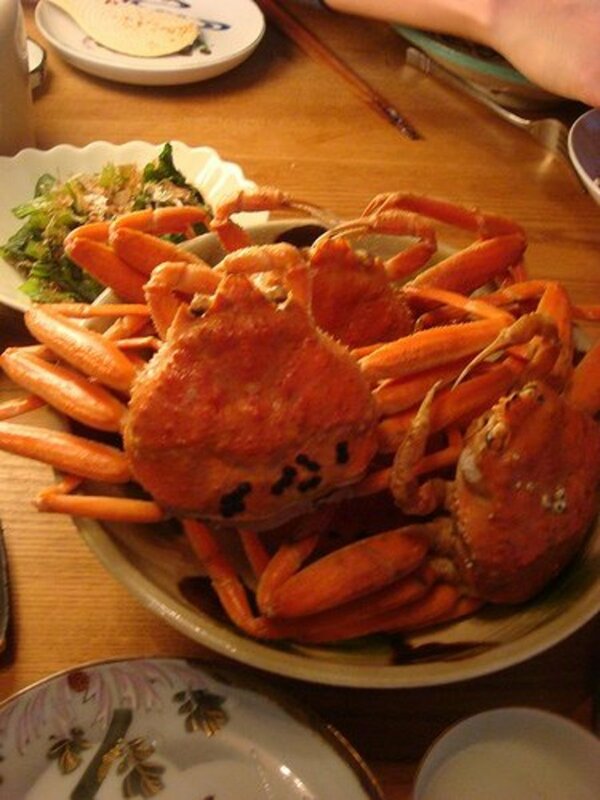 Snow crab is typically sold in leg and claw clusters, with some meat from their body attached to it. 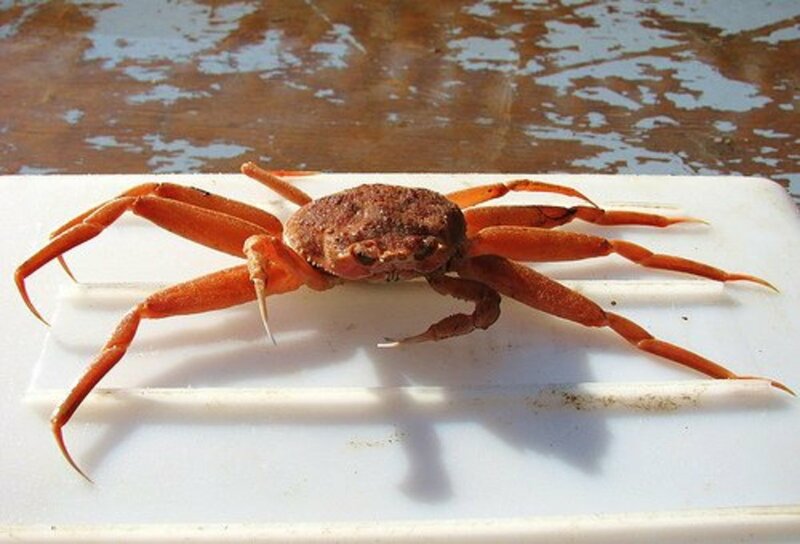 This crab is found starting in Alaska and all the way down to Oregon. They’re caught in pots and traps, and have a sweet and very flaky meat. Tanner crabs are usually sold in leg clusters and as lump crabmeat. Stone crabs are found in the Atlantic—from North Carolina to Florida, and in the Gulf of Mexico. Generally, only the claws are eaten. Crabbers remove one claw and return the crabs to the water, where they’ll regenerate a new claw. 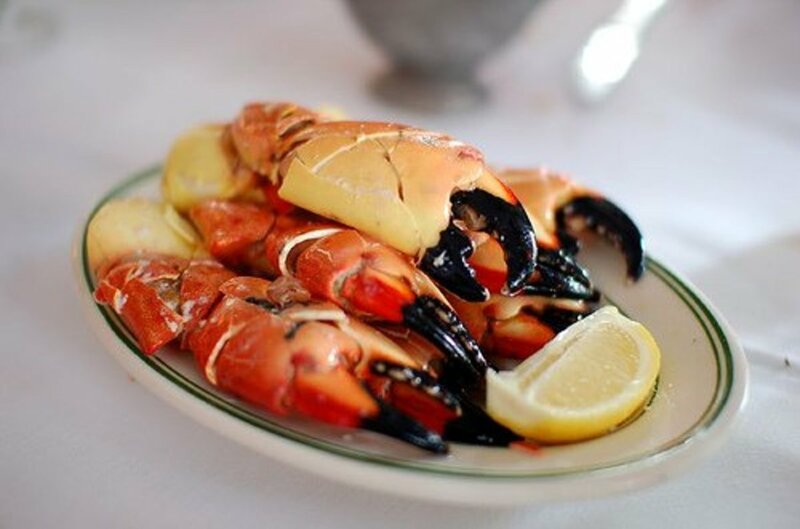 Stone crabs are caught in traps, and their meat is sweet and succulent. When buying crab legs and claws, it’s better to choose your own individual pieces instead of buying pre-packaged frozen ones. Not only will you get to inspect the crab for freshness – you can also pick the best parts. Choose the largest legs and claws possible from the display. Smell them. If they have an ammonia odor, don’t buy them. Feel them. Meaty crab legs will feel heavy for their size. They should be a bright red color and fully intact at the joints. Refrigerated crabmeat is also available and is a great choice if you don’t want to go to the trouble of picking your meat from the shells. It’s available in lump (backfin) and claw meat, with the lump crabmeat being more expensive. If you’re buying live crabs, make sure they’re alive and active. The shells should be brightly colored and intact, as should all the legs. The crabs should be heavy for their size. Soft-shell crabs are available as live, fresh, and frozen. These crabs are very delicate and often die during shipment, yet are still sold as “fresh” soft-shells. They’re still good to eat as long as they don’t have an ammonia smell. If the fresh crabs come wrapped in plastic, then they were previously frozen. 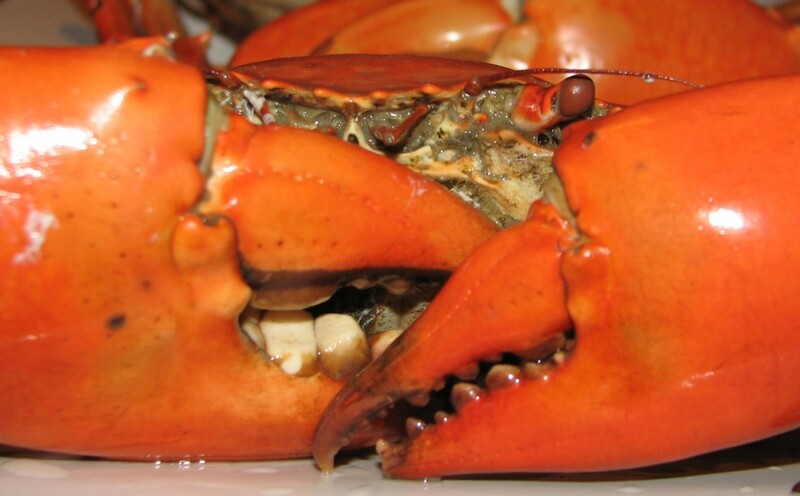 If you have the opportunity to buy live soft-shells, all their legs and claws should be intact, and the crabs should be very soft. “Papershells” are crabs that have already begun to re-grow their shells, and they won’t be nearly as good as true soft-shells. Soft-shell crabs are available live and fresh from May through September. Stores purchase most crab legs in frozen form. 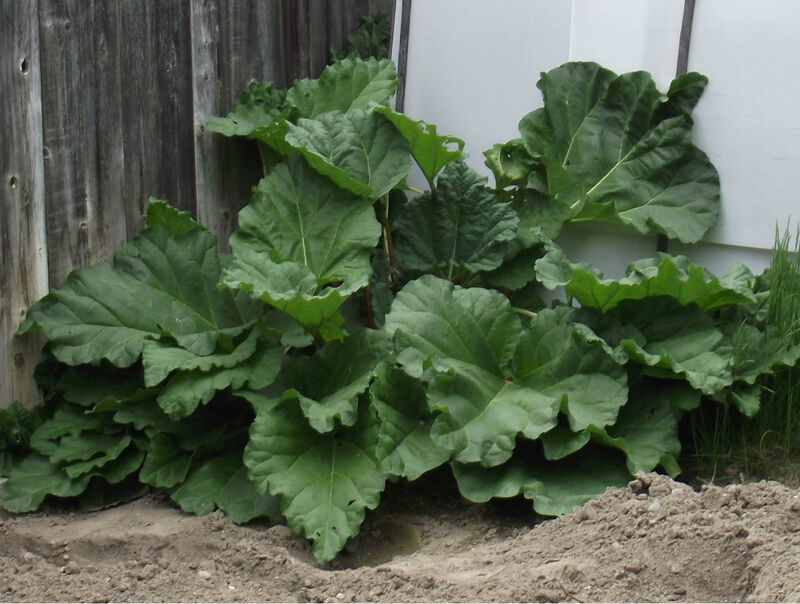 Once they’ve thawed, they need to be eaten within two days. If you buy unfrozen crab legs, ask the clerk when they were thawed. If the legs you buy are still frozen and you plan on keeping them in your freezer, get them there as soon as possible. By wrapping the package in foil or paper, you’ll reduce the chance for freezer burn. Crab legs will keep in the freezer for up to six months. Once crab legs have thawed, don’t refreeze them. Most refrigerated picked crabmeat is ultra-pasteurized and will keep unopened in the coldest part of the refrigerator for months. You’ll find an expiration date on the can or package. Once it’s been opened, use it within five days. Live crabs need to be kept alive until you’re ready to cook them. It’s best to cook them immediately after purchase, but if this isn’t possible, place them in a pan of water and cover them with a wet cloth. Then place them in the coldest section of your refrigerator, where they’ll keep for up to two days. To freeze whole crabs, cook them first. When done, plunge them into ice water, dry quickly, place in freezer bags, and remove the air. They'll keep for up to six months. 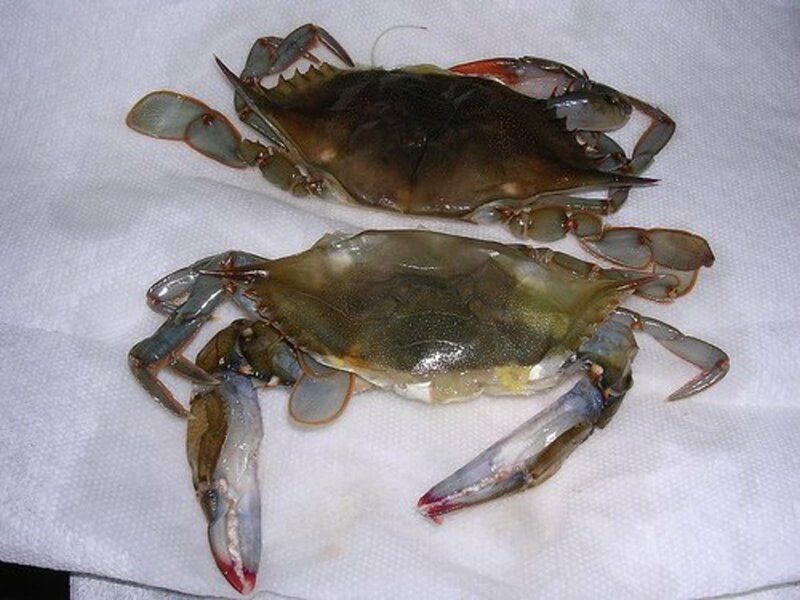 Soft-shell crabs will keep up to five days after they die, but they must be kept in moist paper towels or newspapers and stored in the coldest part of your refrigerator. Keep in mind that the 5-day rule includes shipping time. To freeze soft-shells, clean them first, then place them in air-tight freezer bags. They’ll keep for three months in the freezer. For cleaning instructions, watch the video below. If you have leftover crabmeat, remove it from the shell and store it in the fridge for up to two days. The meat can also be stored in the freezer in plastic bags from which the air has been removed. The crabmeat will keep in the freezer for up to four months. 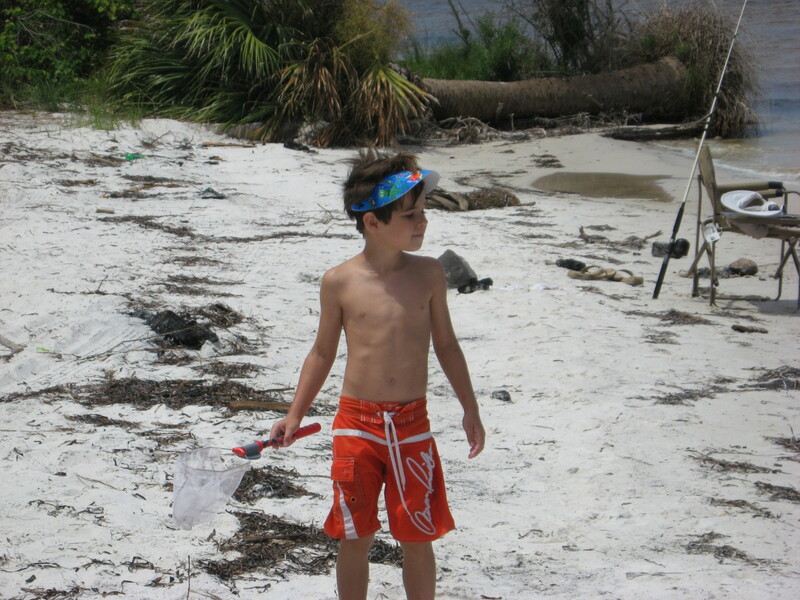 My grandson, Jonathan, on a crab quest. If you live near the East Coast or the Gulf Coast, or if you’re planning to visit these areas, you can easily catch your own crabs! 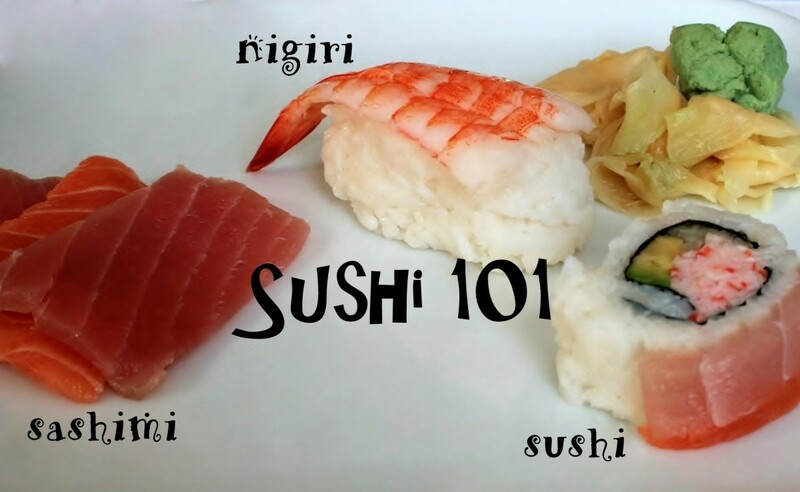 This is a great activity for the entire family, and you’ll love the flavor of just-from-the-water crabmeat. You’ll find articles with videos below that will teach you how to catch, kill, clean, cook, and eat the crabs. Watch the videos below to learn how to cook and clean crabs and crab legs. For more information about crabs and crabbing, including some great recipes, click the links below the videos. Which crabs have the most meat? Stone crabs have a lot of meat in their claws. Is there a specific crab you would recommend for a boil? Whole blue crabs, blue crab claws, snow crab legs, or king crab legs. Love the images of your grandson searching for crab. I used to take my children fishing for crab off the pier when we were on holiday but sadly they never had any success. I love crab but they are a bit of a seasonal luxury here in the UK and usually available ready boiled (thank goodness). We've eaten blue crabs from the Gulf of Mexico and have never gotten sick. But we only eat them a few times a year. I eat crabs every week in Savannah, Ga!! Hi...I have heard that you should not eat any crab that comes from the Gulf in Florida because people have dumped thousands of batteries into the Gulf, and therefore has become feeding grounds for the crab..I would like to know if this is the case. I'm from Louisiana. Spcifically Cajun country. 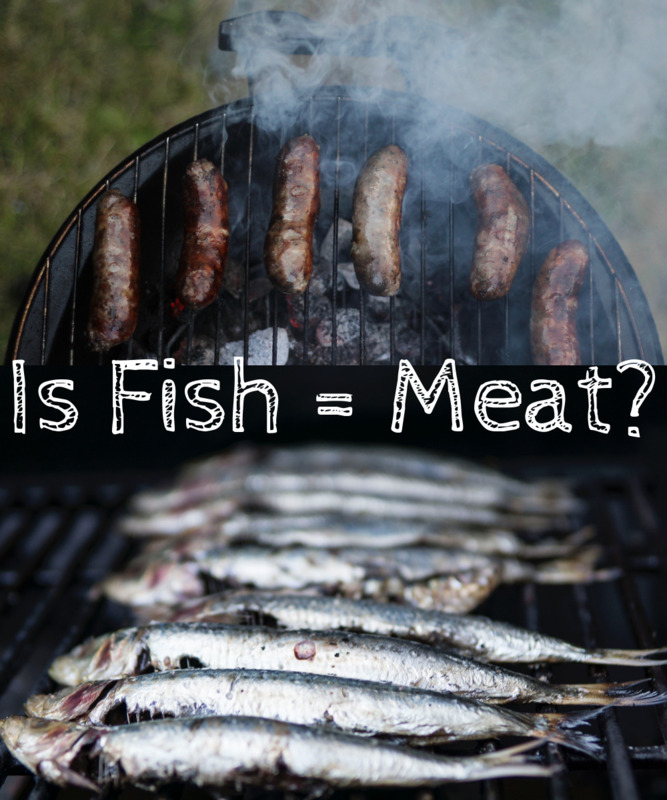 Seafood is a common staple around here, both fresh water and salt water. We love to catch our own and then have a good ole' Cajun boil. As I travel around the country I have tried many different types of crabs. I have not had any crab better than a blue crab. However, most places have no idea how to cook them the way Cajuns. Everyone should have the opportunity to try them. Ca' cest bon! Very useful since i love eating crab and always wanted to catch my own. Thanks for the article i will use it for future references. I am from the Bahamas we catch crab in the Exuma's Andros Island and Eleuthera's are our crabs considered Stone Crabs. They are bigger and sometimes smaller and blacker than the ones I see in Florida. Do you know and what are our crabs called. We boil, cook in rice and backcrabs? Great hub on crabs. My cousin had a dungeness crab for a pet, long time ago. I love crab meat melts and crabcakes. I would love to make my own crab cake someday. Very informative, Hollie. Lovely pics! Voted up! I love the photos! (And eating crabs.) I really enjoy taking pictures of blue crabs because they frequently turn out great. Luckily, I see blue crabs several days a week. Unfortunately, I am not allowed to catch the crabs I see. Thanks, Nifty! I could eat crab legs just about any time! Wow! So much crab, pass the butter! Thanks for sharing habee, some really great information! Hostage, your crab soup sounds awesome! 5cows, Apalachicola crabs are wonderful, too! 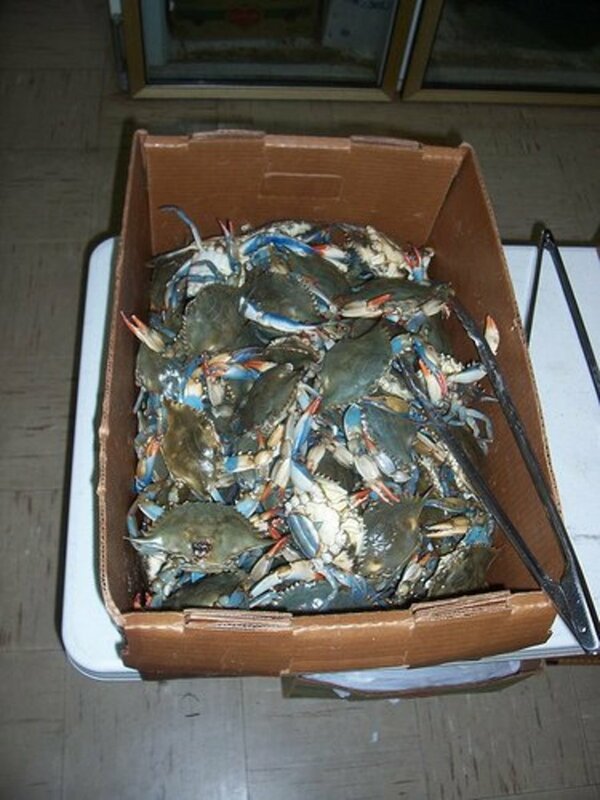 Blue crabs are the beast, right out of the Chesapeake Bay. Blue crabs rock! Great hub, habee! I just made my mother's cream of crab soup for some friends and it was so good I wanted to write about it. I received two marriage proposals one from a male, one from a female for that soup. I only made the stuff because she said I couldn't. It was ridiculous, and if I knew how to measure when cooking I'd make it into a hub. My Maryland blood celebrates all things crab, and I love this hub. Wander, I love all types of seafood, too! Miscook, try placing them in the freezer first to stun them! Wow! I'm hungry. I love cooking crabs as well but the hardest part is when you bought live crabs and getting them clean first. They always caught my fingers. I bought lump crab meat from whole foods. it wasn't frozen but i made crabcake patties and put them in the fridge at home. will they be ok to cook for tomorrow at dinner? Nancy, I have a hub about how to catch crabs. It's really fun! I really learned a lot from this hub. I loved all the pictures. I would love to try to catch crabs. It looks very interesting. There are few things I like better, Granny! Great hub! We buy King Crab and Snowcrab all the time. Love it! Buckie, I got sick eating crab once, but it wasn't the quality that was the problem - it was the QUANTITY! Anne, I like the imitation in salad, but that's about it. It can't hold a candle to real crabmeat! Dolores, don't you hate it when that happens?? Andy, they seem to have that effect on many! Yes, HH! I'll stone you with stone crab claws! Austin, we catch our own, too! Even the kids love it! Drbj, when that happens, do you feast on crabs?? sheila - ugly but delicious! Sam, how does one survive YEARS without crabs?? Pick some up for me, too, V! Wendy, we love 'em down here, too! Holy cow, girl - your arms must be ready to fall off! Very thorough and I think you covered crabs...I have to try them again though seriously. I got sick twice eating King crab and not sure if it was how my brother-in-law prepared it or didn't prepare it so maybe I'll give it another whirl. It looks SO good - now I'm hungry! Great hub, Habee! Question: what's your take on imitation crab meat? I'm not well versed on crab, but I'd like to try the real thing (I've had the imitation). habee - being from Maryland, I love crabs and last week made the best crab cakes I had ever made. As I rarely use recipes, I am not exactly sure how I did it! My son was visiting from Boston and was dying for crab cakes. Now I am hungry. And I've fixed chicken for dinner. I will be very disappointed. habee your hubs always make me hungry. Sorry, but I had crab twice and wasn't impressed. Will I be stoned now? I used to catch crabs when I was a kid. Loved em' I used a string with some bacon tied to it and then when the crab came up to get the bacon, I slipped a net under it's delicious shell! Oh, the memories of the Texas coastline. Here in south Florida, if you live near the ocean during certain times of the year you can see the blue crabs migrate from higher land to the ocean. There are so many of them that the road closest to the ocean looks like it is blue because so many of these critters are literally covering the entire pavement. Quite a sight to see. Your pictures were so good! No, I'd never seen a picture of a kind crab before. Actually, it looked more like a sea monster to me; if I'd ever seen one at the beach, that's what I would have thought. I love crabs. I haven't had any in years. This hub sure has made my mouth water. I'm hungry now Habee. I haven't had crabs in a while. 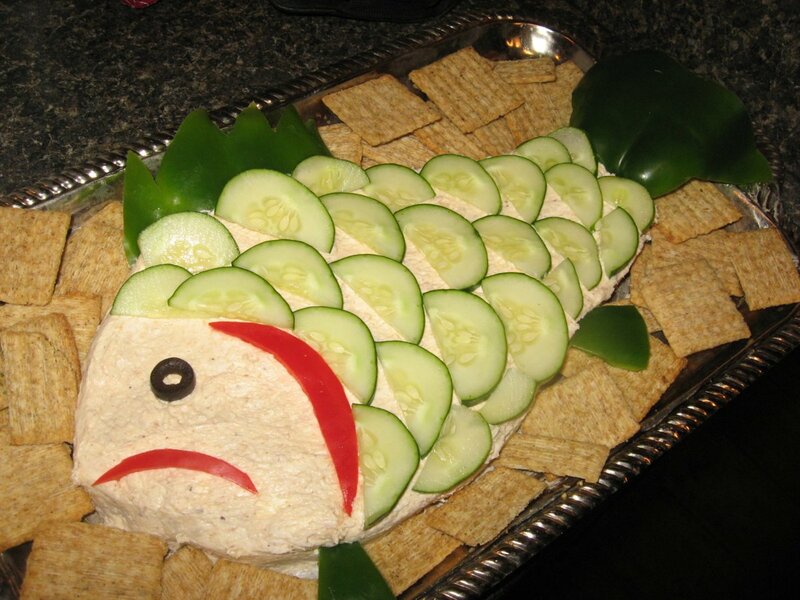 I think I will be dropping by my local seafood shop very soon! We love crabs here in Maryland. Lovely Hub!